Donut County has made its PlayStation 4 debut, giving players a chance to play around with physics by controlling a hole in the ground and sucking everything up. 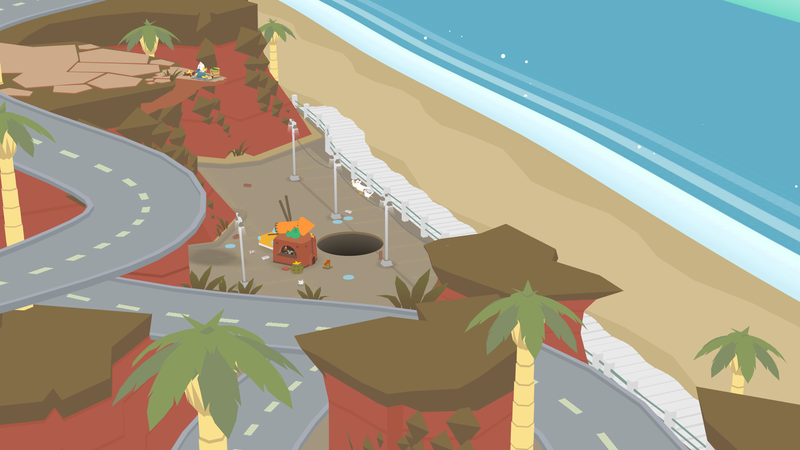 But before it was Donut County, developer Ben Esposito approached the game from a very different angle. Originally called Kachina, the game centered on Hopi culture. Originally [the game] was called Kachina… the word Kachina comes from the Hopi tribe and they’re like these religious figures and I had been introduced to them as these dolls that I saw at like roadside gift shops. The aesthetic is what I thought was really cool. But I’m not native. Esposito’s experience is a common one for people who fall into cultural appropriation. He enjoyed surface level aspects of a culture, without having a deeper engagement or understanding of it. Before his realization, he saw it as “a ready made aesthetic” that could serve as a “cool talking point” for his game. Initially, reception was positive. Then, Debbie Reese wrote a blog post on American Indians in Children’s Literature detailing the ignorance of Esposito’s work, with the hopes that he would make changes. I was thinking about that girl, my character… and I knew I wanted the game to be about this girl who is disconnected from her culture because, like, I didn’t know about [Hopi culture] and I wanted to learn about it. And the Kachinia are teaching her where she came from. [Meanwhile] the player would [also] learn about their story and the importance of the Hopi tribe. Like okay, this makes sense. I would be educating people about this story. This story was not intended for me to hear at all that’s why I couldn’t find [information on it]… I couldn’t do it justice because [the Hopi tribe] didn’t want me to do it justice. They didn’t need me to do it justice. Now Donut County is about the place I live and its about stories that I’m involved in. Research does not equal lived experience and it never will. And work that tries to represent someone else’s live experience has the danger of invalidating it. Folks are not trying to silence you by telling you that you’re silencing them. When you get called out. Shut up and listen. Examine your behavior. Shut up and keep listening. Marginalized folks do not owe you their time in explaining these things to you. You are not entitled to marginalized folks narratives and you are not helping by adding your perspective to their stories. If it’s really important to share someone’s narrative, let them tell it. If they don’t have the tools, use your position to empower. If they don’t want to share their story that’s fine because it’s not your story. In all creative industries, cultural appropriation is a cause for concern and will continue to crop up, as games draw inspiration from the world around us. We’ve seen games go in depth on the culture they’re exploring and upcoming games raise concerns regarding how they’re exploring it. Ben Esposito’s story is still relevant today and will, hopefully, continue to fuel the conversation.